This weeks sees the start of local Yarra Valley Strawberries. 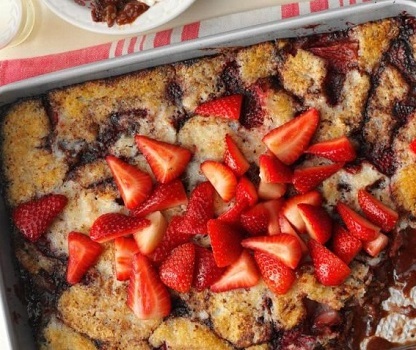 I have included one of my favourite Spring recipes below – Chocolate Strawberry Cobbler – so good either hot or cold…and even better the next day! Preheat oven to 180°. Place butter in a baking pan; heat pan in oven 3-5 minutes or until butter is melted. Meanwhile, in a large bowl, combine flour, sugar, milk and vanilla until well blended. In a small bowl, mix cocoa/melted choc and remaining sugar. Remove baking pan from oven; add batter. Sprinkle with strawberries and cocoa mixture; pour boiling water evenly over top (do not stir). Bake 33 – 40 minutes or until a toothpick inserted into cake portion comes out clean. Let stand 10 minutes. Serve warm with cream and additional strawberries. There is a divine bread and butter style version of this recipe too, with choc croissants (the bread) and strawberries and berries instead of raisins. Its also very good and easy to make.